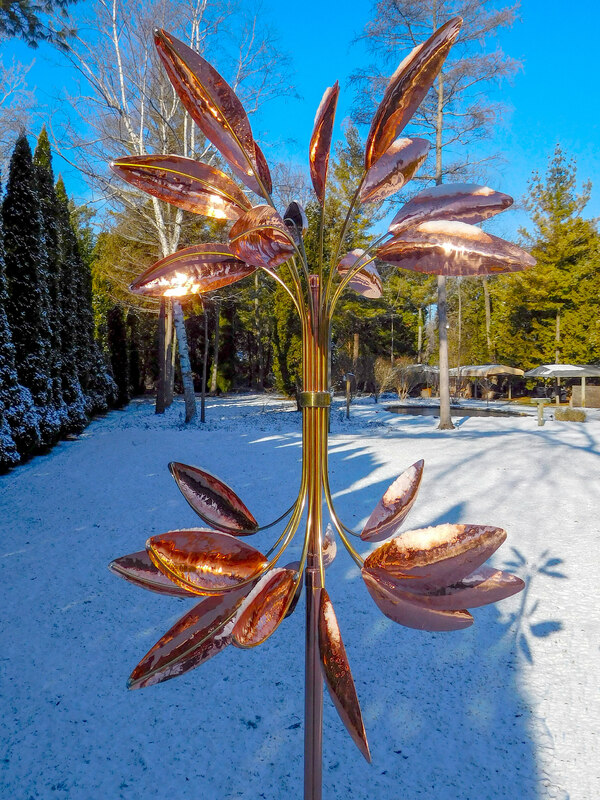 Thanks for the beautiful piece." 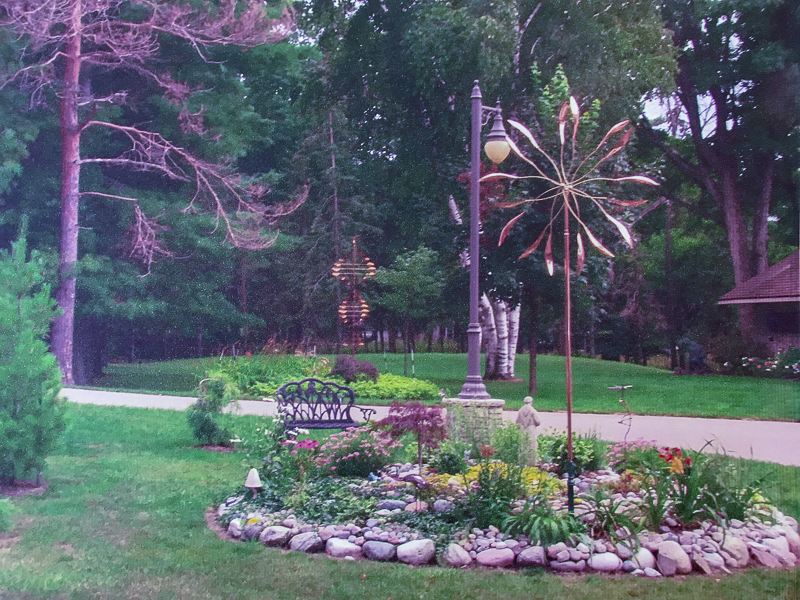 Providing you with a piece of art for your yard or garden. 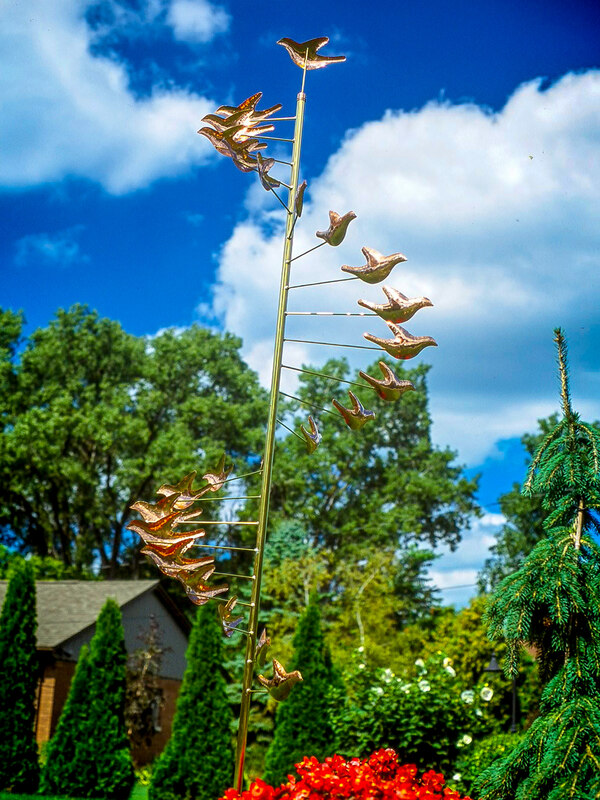 These wind sculptures (also referred to as Garden Art Sculptures) are produced in very limited numbers in a small shop in Mid-Michigan. 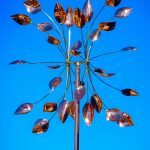 The wind sculptures are completely hand crafted from the finest copper, brass, and stainless steel. 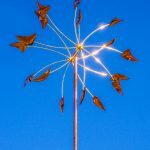 Each wind sculpture incorporates high tolerance parts machined from brass and is fitted with sealed stainless steel ball bearings allowing rotation in the slightest breeze. 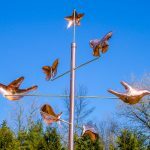 These wind sculptures are durable and completely weatherproof and can remain outdoors year-round providing years of enjoyment. 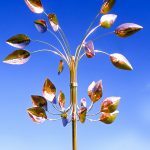 High quality wind sculptures are a fine addition to any yard or garden either standing alone or clustered in groups. 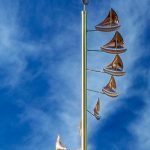 These wind sculptures make an excellent gift for the hard to buy for person. Please go to our products section to view the many models available along with videos of selected models. 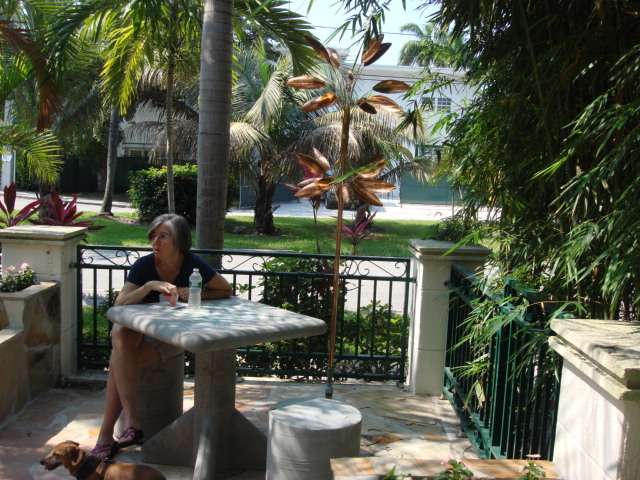 Certain units can be special ordered and custom designed to your specifications. 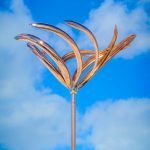 If you have something special in your life that you would like to see on your wind sculptures, contact us to discuss your special design. 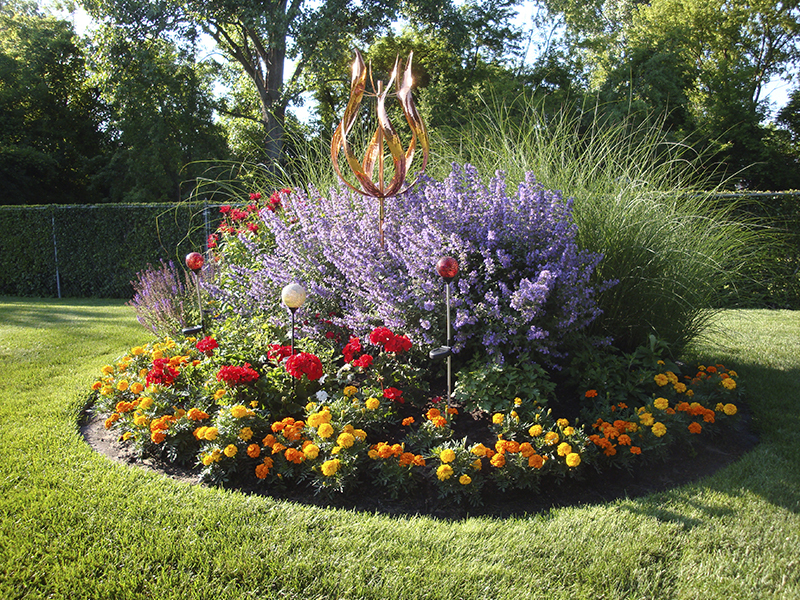 We take great pride in our reputation for quality and excellent value. If you are not completely satisfied within thirty (30) days of purchase, return the undamaged unit for a full purchase price refund. 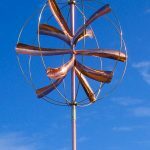 Installation will take only a few minutes using common household tools. 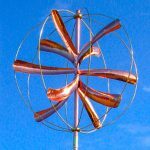 Your wind sculpture will be ready for years of enjoyment. 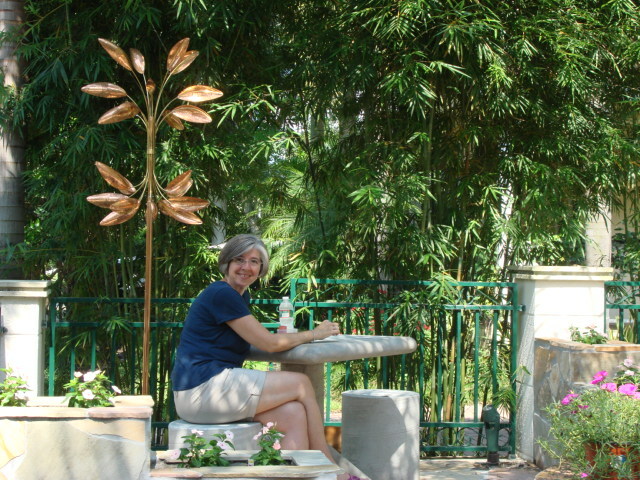 Take time to relax and visually enjoy your new piece of artwork. 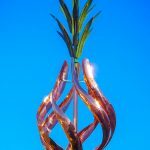 Most units can be crated and shipped at the cost of $100 – $300, depending on size and shipping destination. 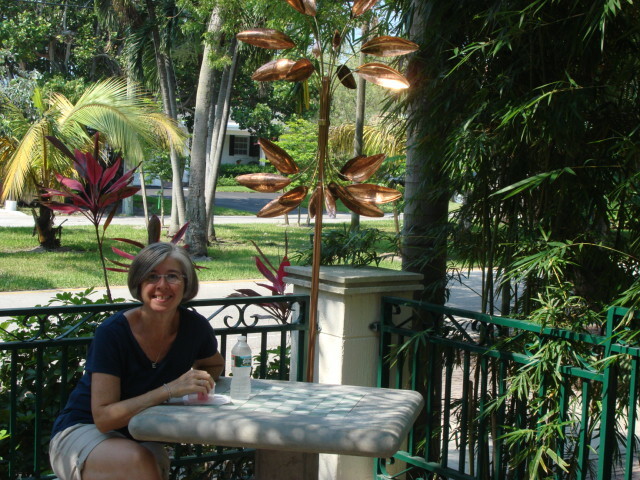 Certain large units can be shipped via truck freight at reduced charges. 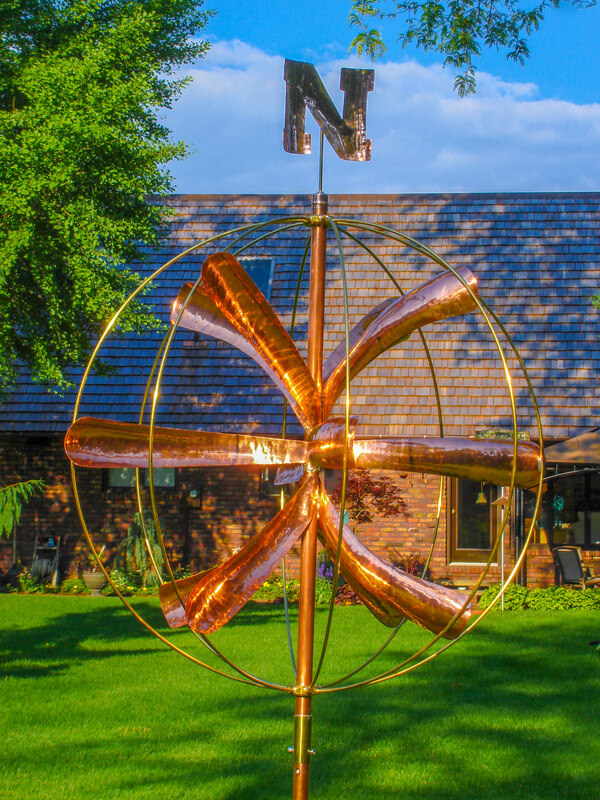 Many of the sculptures can be built as take-down units to facilitate overseas shipping using US Postal Service, with the exception of the Evolution and short Ellipse, which ship for $40 each. 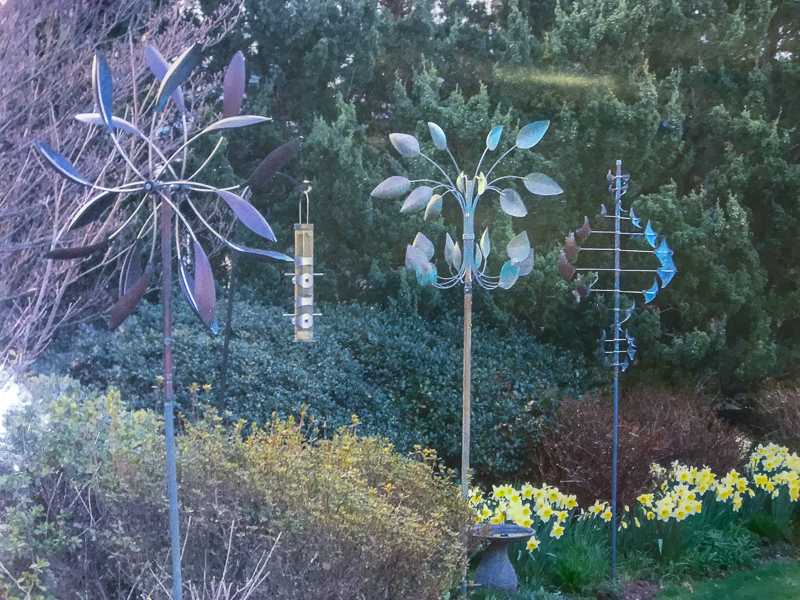 We would like to thank our customers who have sent us photos showing our wind sculptures placed throughout their yards and gardens. 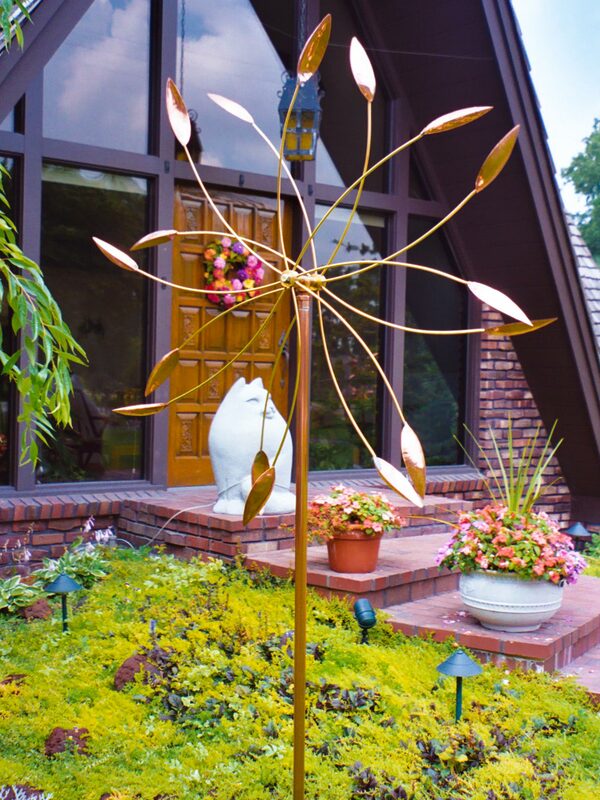 This is a way that you are able to visualize how our kinetic wind sculptures enhance the look of your yard, garden or special place. 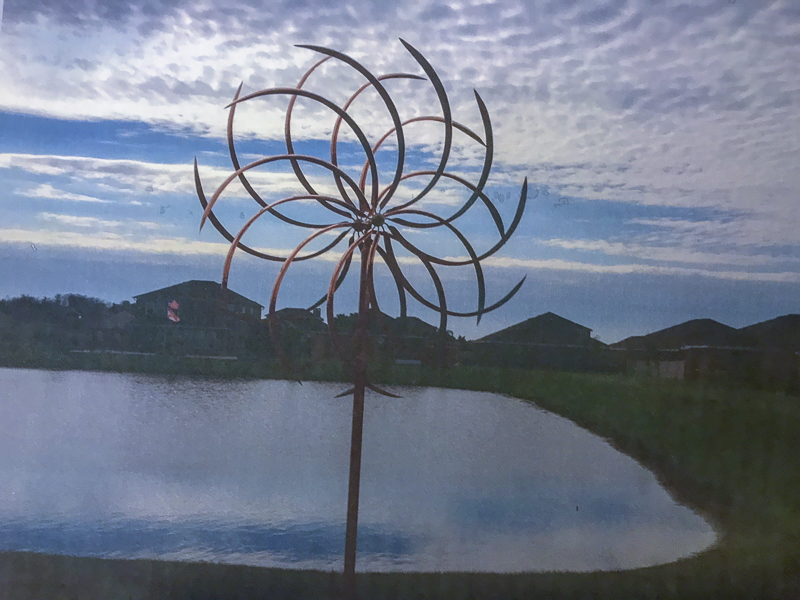 Thanks Jere, I just wanted to let you know the wind sculpture got here and it looks great. 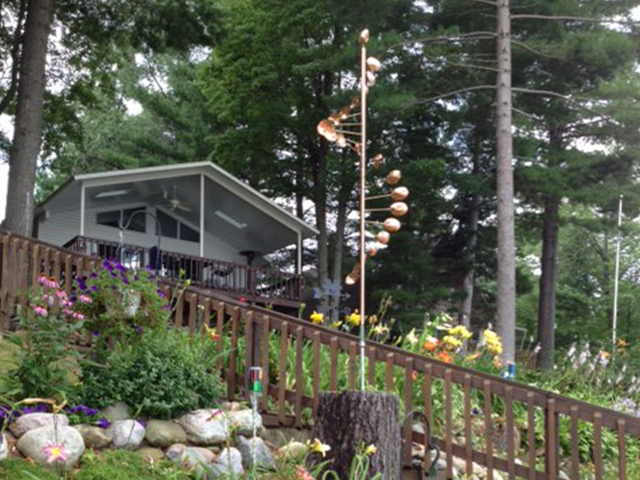 I am impressed by your craftsmanship! I have already gotten compliments and have given others your name. 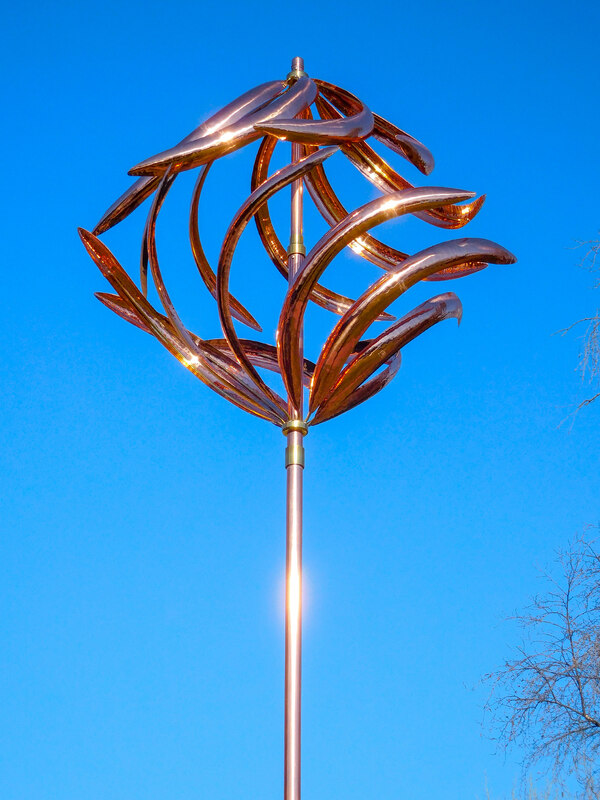 I was overwhelmed with emotion when I saw this stunning piece of art. 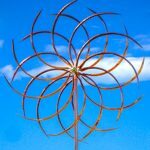 We saw a pineapple wind sculpture in Maine last summer and I loved it. 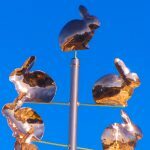 We asked around to find out where we could purchase one like it. This one that you made though, is more beautiful. It looks like it belongs in a museum and not in our house. We are going to treasure it right in our own back yard and enjoy it so much. 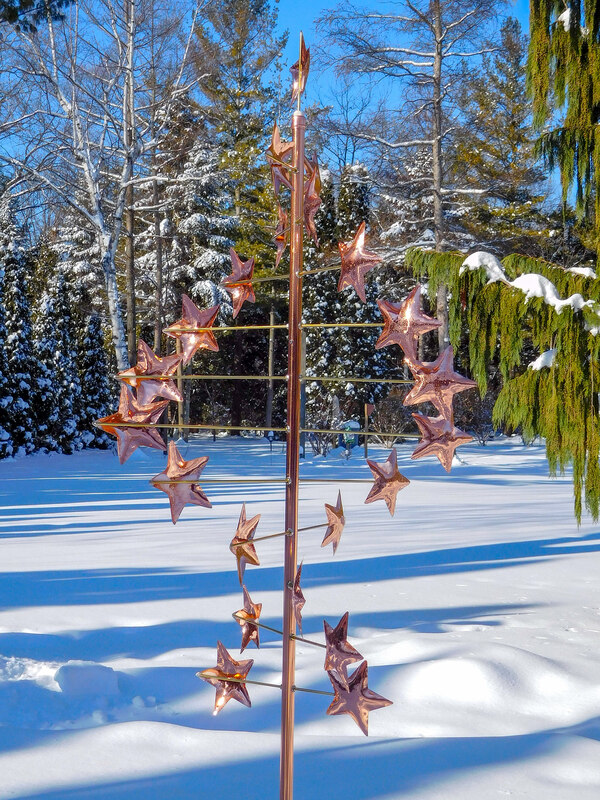 Sculptures arrived today and we have 4 out of 5 up. They are so beautiful! Great job crating and packing ñ really appreciate it. 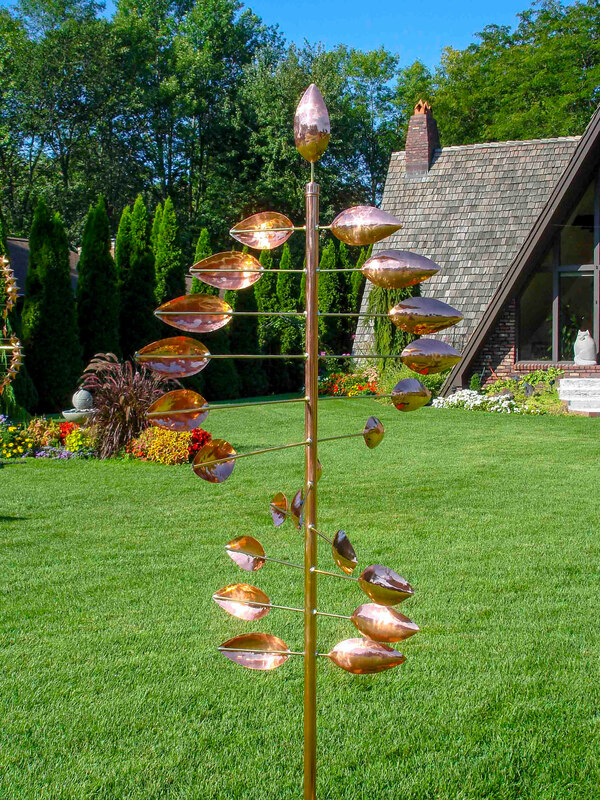 I wanted you to know that we absolutely love both of the copper sculptures we bought from you. I find myself constantly looking out the window to see if there is any action. They both are beautifully made, look fabulous, and give us much joy. 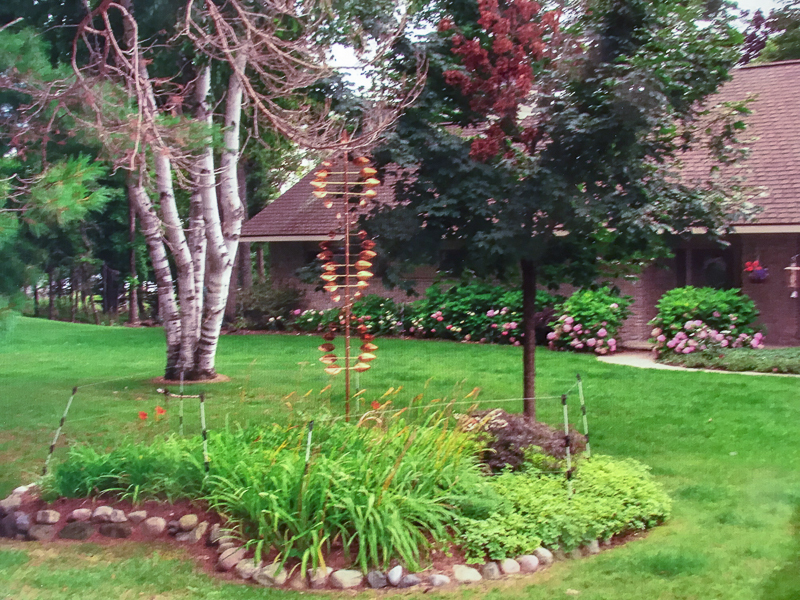 Our sculpture garden is really enhanced by your two sculptures. 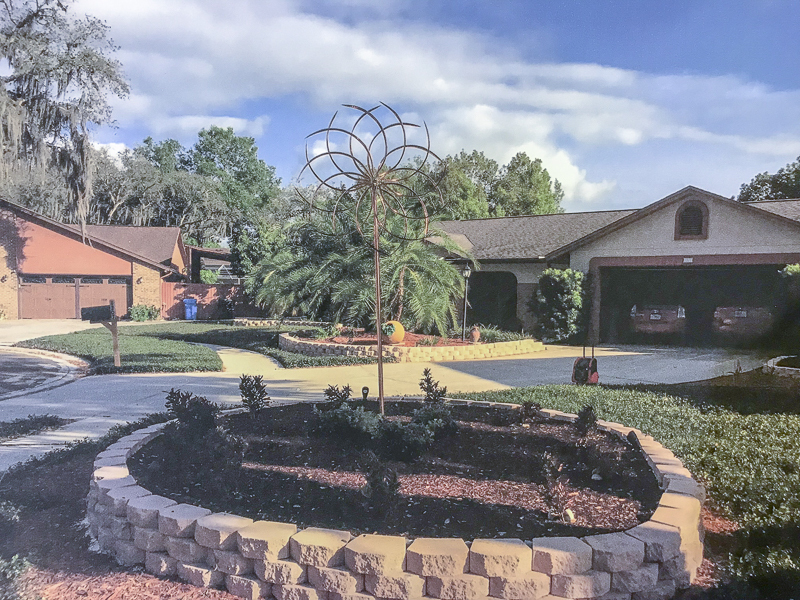 At last our front yard landscaping project is complete and your sculpture is the highlight! Thanks for the beautiful piece. 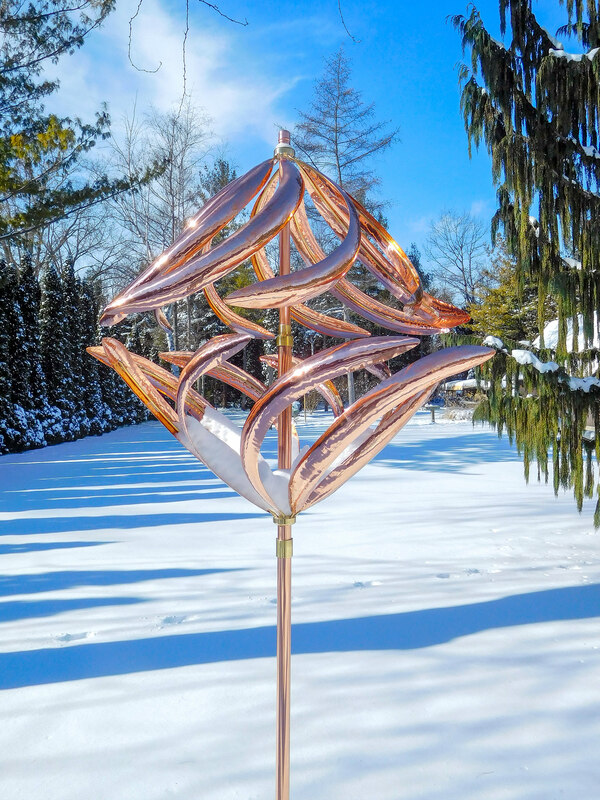 You should see our wind art in the garden it is just wonderful and we are very happy with it. I bought this Friday on my way north. I just love it. 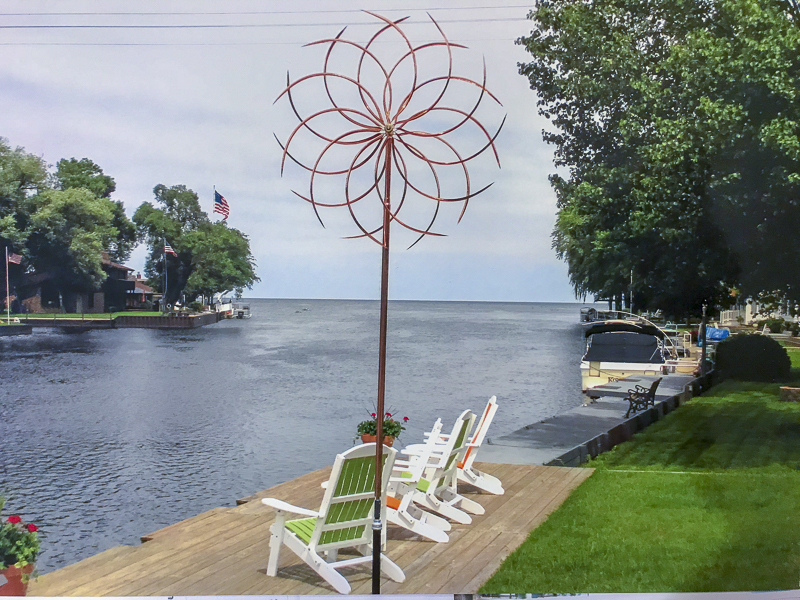 It looks stunning and it's the only one on Lake Ogemaw. I so appreciate your talent! 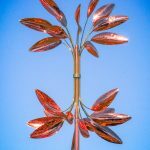 Made in Michigan by Cadmium Design Studios.